As soon as this was being sold with the tag line 'featuring members of Dear Landlord' I was immediately on the No Idea website adding this 7" to my cart. I love 2009's Dear Landlord record Dream Homes and have been waiting and waiting for a new album. 5 years on I get the feeling that's probably not happening, but if this 7" sounds anything like they did, it's a smart purchase. Well, it's a mixed bag. It's definitely very good, gruff, melodic punk rock. It's has some of the darker elements of Dear Landlord, but it's just not quite in the same league. 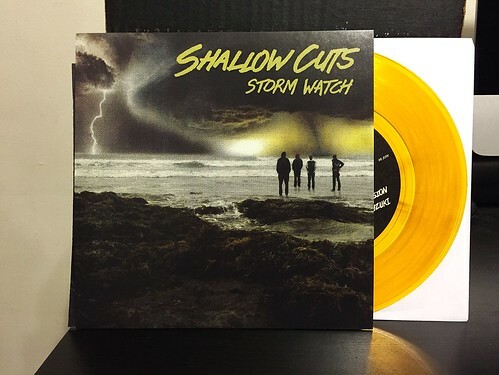 If anything, Storm Watch is the victim of unrealistic expectations and when viewed as it's own release without trying to compare if to another band, it holds up pretty good. It's 4 solid songs, but the best one is definitely "Calamine." This is where the band really ramps things up energy wise. It's got a fast poppy verse that blasts into a really hooky chorus. But what really makes the song is the singalong breakdown right at the end. Not taking away anything from the other 3, but if this song is any indication of what the band could achieve over the course of a full length, I'm almost as excited about it happening as I would be a new Dear Landlord.